When specified on an invoice, a settlement discount is a percentage discount given to the customer for prompt payment. For example, a 2% discount if the invoice is paid within 10 days. The terms under which the discount can be claimed are entirely up to you and should be included within the payment terms you enter. The prompt payment amount is indicated on the invoice in addition to the regular invoice total. Navigate the relevant customer order. 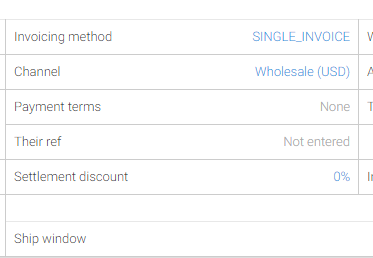 Click the icon next to "Settlement discount" located in the top, middle section of the order as shown in Figure 1. 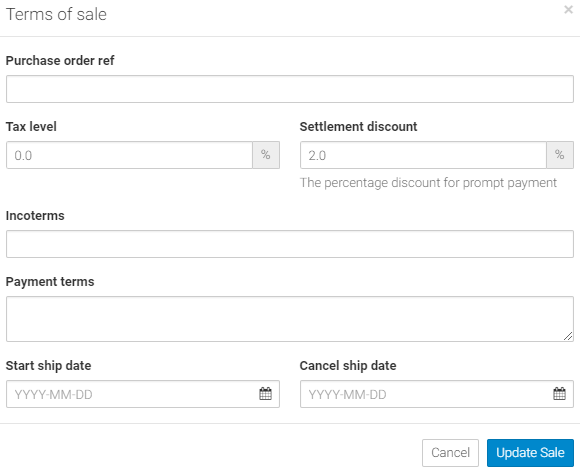 The "Terms of sale" dialog will open as shown in Figure 2. Enter the Settlement Discount as a percentage in the Settlement Discount field as shown in Figure 2. Note that a settlement discount can only be specified before invoicing. When you create an invoice, you will see that the settlement discount and prompt payment total are summarized at the bottom. The summary also details how the VAT has been calculated on the discounted subtotal. To calculate and show two difference tax/VAT values based on original and (settlement) discounted goods totals. To calculate tax/VAT based on the discounted goods total only. (Choose this option to treat the additional untaxed amount as a financial penalty). To calculate tax/VAT based on the original goods total only. Navigate to the Tax settings page to choose the option that is appropriate for your business. When you've received a prompt payment from your customer and entered the payment into Stitchex, the invoice will still have an outstanding balance. To clear this balance, click the "Settlement Discount" button on the invoice in question. This will record the settlement discount against the invoice and clear the outstanding balance, marking the invoice as fully paid.